Having a dog means having a sidekick to walk with you through each new experience -- even the stressful ones, such as moving. 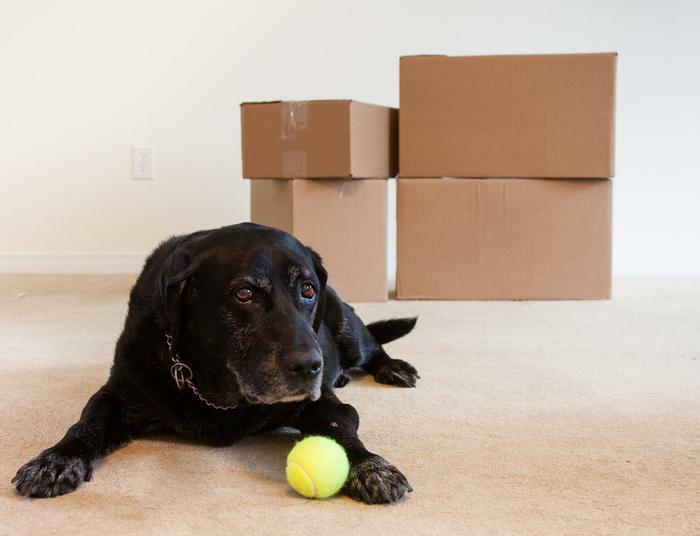 Packing, moving, and adjusting to a new home may be as stressful for you as it is for your pet. As the rooms in your home slowly empty, your four-legged family member may begin to sense an impending change. But moving doesn’t have to make your pet feel as if their world is being turned upside down. Here are a few tips for helping your dog get through a move safely and happily. Try to maintain your dog’s regular routine. Keep feeding times, walks, and playtime the same as usual. “Dogs are generally quite content as long as their social group (people, other pets) remains fairly much the same and as long as the daily program (routine) remains fairly constant,” says Dr. Debra Horwitz, a veterinarian. Already have the keys to your new home? Take your dog for a visit or two while the house is still empty. Take some high-value treats along and reward your pet as you go for a leashed walk both inside and outside the home. "Play toys, affection sessions, and food treats can help the pet make the move to the new home a positive experience," Horwitz says. Pack slowly. Because dogs thrive on routine and familiarity, a home that is suddenly devoid of all familiar objects can feel scary and uncomfortable. Consider packing a little bit each day instead of hauling everything away over the course of a week or weekend. Create a safe zone. If you don’t have the luxury of packing slowly over time, leave just one room or space (the one in which your dog spends the most time) the same for long as possible. Keep the room as quiet as possible. Set aside comfort items. If your pup has a favorite bed, blanket or toy, leave it out and accessible throughout the entire process of packing, moving, and unpacking. Be consistent. Place your pet’s bowls, toys, and bed in the same spots as in the old house -- for example, keep food bowls next to the refrigerator or your pet’s toys in the family room. How long is it safe to leave your dog home alone?